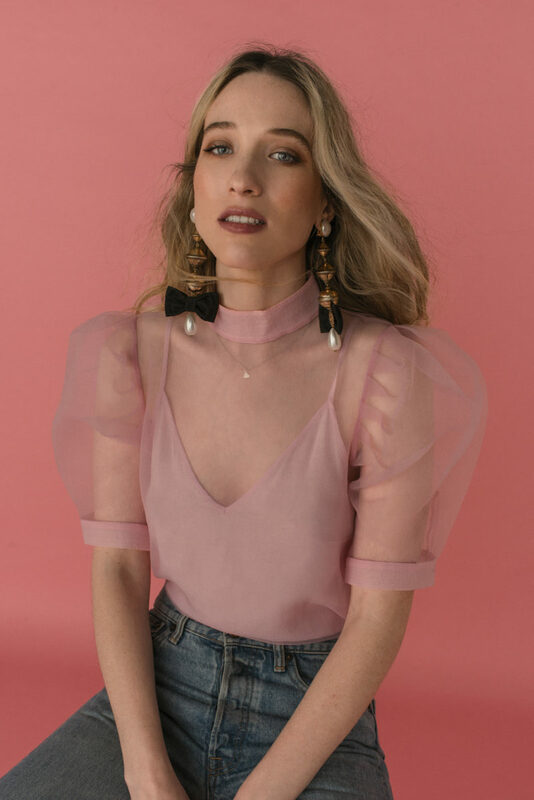 In celebration of their 20th Anniversary issue, Kellie Hush asked my dear, talented, sound-and-screen-slashie friend Sophie Lowe and I to shoot each other while fleshing out everybody’s favourite dirty word: “Millenials” – and all the assumptions that come with it. 1. The Millennial prefers experiences to material things. Margaret Zhang: I think everybody I know our age travels so much you don’t think twice about buying a $2000 flight, but when you have to buy a $1200 laptop, you’re like, Do I need one? Sophie Lowe: Right. And it’s like, I’ll just get Ubers instead of buying a car. I also don’t know that many people who have their own place these days, but I don’t know if that’s just because Australia is so expensive that it’s kind of rare for someone to own their own house. I feel like there used to be more of a sense of I can’t wait to own my own house, whereas now everyone’s like, I can’t wait to travel. Zhang: I guess that’s why middle-man businesses are so big — the ones that don’t actually own anything. Uber doesn’t own any cars, Airbnb doesn’t own any houses — it’s like a renters’ market. People pay for a service. For now. For the convenience. Lowe: Because no one is patient — they just want to go, go, go. 2 . … lives through social media. Zhang: I have definitely had to really catch myself over the past few years and try not to live my life through my phone — in the same way that you want to capture everything because you have all these experiences and then you kind of go too far and have to remind yourself there will actually be another sunset tomorrow. Lowe: Yeah, that’s true. But then there was this one time I did [forego my phone], and I was proud of myself, but then regretted it later. It was at a Beyoncé concert and I wanted to just be in the moment and soak it all up, but at the same time she was right in front of me, and later I thought, Why didn’t I capture this moment? I guess I have the memory. That’s what it’s all about, isn’t it? Zhang: I totally understand that panic when you think, I should take a photo because then I can show people I did this. Lowe: … so people believe me that I was there. 3 …. lives in the now. Zhang: I think it’s uncool to have a life plan — not in a ’trend’ way. It’s just people have realised the planning that maybe your parents did — the prescribed life — maybe that doesn’t work anymore. Lowe: Yeah, I think there’s a lot of We’ll deal with it when it happens. Personally, I love planning, I love having a goal, and I have been lucky because I have found what I want to do — I want to act for my whole life — and some people don’t get to find out what they want to do for ages. They really struggle with that. Or is it because they are Millennials and get bored quickly? Zhang: Maybe. I mean, there are just so many options. I read somewhere that Millennials will change their careers seven times in their lifetime and, well, they can and it’s fine. I think the biggest hurdle I overcame in the past two years is understanding that doing something different doesn’t mean you have failed at the previous thing, and it’s not a bad thing that you are moving onto something new. It just means it’s a new chapter. Lowe: Yeah, it’s like you are constantly growing and changing. Zhang: Yes, it’s ‘onto the next’ and that’s OK. I don’t think I plan — I’m not like, In 10 years I will have babies. Lowe: I am. I’m like, When I’m 30, I want to start having children — I mean, 30 is coming up now, so I’m like, Ah, wait! But I’ve always thought I want to get married, I want to settle down and have my own place — I’m kind of old-fashioned like that. Zhang: But I also feel like there’s such a difference between being spontaneous and living in the now in that sense and then really being present with the people you are with right now. Lowe: Yeah, it’s harder than you think. Zhang: It sounds so catch-phrasey, but I think it really makes a difference when you focus on what you are doing at this point in time, rather than scattering and doing a million things. 4 . … is constantly looking for instant gratification. Zhang: I was cutting my film [There’s No Space Left in C# Minor] last year and it was really finicky stuff… and you just get square eyes looking at the computer. Every time I hit a speed bump I found myself instinctively reaching for my phone — not to do anything in particular, it was just like, Oh, there are so many things to do on here, there must be something else I could be doing. Then I feel like that makes people take this attitude of, Well, you can buy something and have it in an hour, so you could prospectively buy a career and have it in a week — I think that’s maybe the mentality. 5 . … is mollycoddled by their parents. learning about the social norms and the cultural norms with you as you are growing up. I mean, I grew up as an Australian, which is very different to the Chinese household in which I lived. So I wouldn’t call it mollycoddling, but definitely involved. Lowe: I think there are a lot of Millennials, the way they are brought up, their parents had a harder life, and so when they had kids they felt like they needed to give them things they never had and to tell them they are special and that they can do anything. So we were brought up believing all these things, but in the real world that’s not actually how it works. And when something goes wrong, we are really stressed and confused because we were told we could do anything and that because we are special for some reason it will just somehow happen. But my parents struggled a lot. They come from a really small town in England, and when we moved to Australia when I was 10 with my brother, they just wanted me to have a better life than they had. 6 . … never leaves the family home. Zhang: I feel like this is quite specific to Sydney or just cities where it’s expensive for young people to live. I mean, I think it changes depending on where you are from and also the culture of where you are from. So, for example, we don’t have that culture in Australia compared to the US, where kids just leave to go to college — it’s just totally normal for you to go to the other side of the country when you are 17 there, whereas here, people do move interstate for university, but I don’t think there is as intense a college culture, and people just, like, go to the university in their city and that’s totally fine. And why wouldn’t you live at home? It’s so bloody expensive, and how are you supposed to focus on your studies, work a part-time job and pay rent that eats all your money? I mean, take the path of least resistance, people. And even now, I stay with my parents whenever I’m back in Sydney. Zhang: Because it would almost seem rude and selfish not to. Zhang: Why would you not? I think it’s so important to spend time with family. Lowe: I am sleeping on a single bed, which is weird. But I’m with my parents, so it’s nice. 7 . … has little loyalty to employers; the idea of being in the same job for the next decade frightens them. Zhang: I have a lot of friends who are leaving corporate lives to do what they always wanted to do, but freelance. I think people feel undervalued in the workforce and they realise the security of being in a full-time job is not worth it. I mean, if you’re not happy and you’re trying to communicate with an older generation who doesn’t value you because they think you should come up the way they came up in the ’80s, then, well, there are low-cost barriers to entry to set up your own business, and so people are just going to take their brain power elsewhere. Lowe: And make the most out of what they have. Zhang: On a personal level, I feel like I just have a general universe of things I would like to do or a level to which I want to do things, and then all my choices are around, Is this contributing towards this greater standard of work that I want to do or the type of people I want to be around or my general happiness? 8 . … is addicted to avocado on toast. Zhang: Obviously. Everybody loves avocado on toast. Zhang: Trust nobody who does not like Keanu Reeves or avocado on toast. Lowe: Totally. If you don’t like Keanu Reeves, something’s up. Zhang: He’s just so likeable. Zhang: So is avocado toast. Avocado anything. Lowe: It’s rare I go a day without some avocado somewhere. 9 …. is politically aware. Zhang: I think so. But my huge frustration this year has been this social-media activism idea of, you know, Oh, I went to a protest, I went to a march, let me lnstagram that I was there. Lowe: Yeah, it’s that thing of just going [in order to] post a picture on your ’gram so it looks like it’s important to you. I mean, maybe it is, but you can do things behind the scenes that actually help. Zhang: Exactly. And just because you don’t post something, it doesn’t mean you don’t care about slavery in Libya or women’s rights, because that’s also a slippery slope — if I post about the refugee crisis, does that mean that I don’t also care about coral bleaching? Lowe: If you care about it, you do something about it. Zhang: And you don’t have to do something publicly — it’s totally acceptable to quietly donate money to a cause you care about or to volunteer. 10 …. is a slashie. Zhang: I think you have to be — with a few exceptions. I really don’t think medical doctors should be slashies — you should just focus on saving lives, that’s really important — but, generally speaking, I think it’s fine to have multiple interests and passions external to what you do to make money. And it feeds into each other — I’m sure your music helps you creatively. Zhang: I think in past generations there has been this idea that you learn all you need to know in university — or whatever educational institution it is — as a skill set, and then you go into the workforce and apply that for 50 years, and I just don’t think you can cut yourself off like that anymore. I think you need to be constantly learning. Lowe: As a creative, it’s hard to be just one thing. Zhang: I just don’t fit into a nice box or label. Lowe: When I first started doing my music, I was like, Oh, I’m going to be one of those ‘actors who does music’ — it’s so lame, but then I thought, But I like it and I feel like I’m hopefully writing nice songs. I didn’t want to be categorised in that way, so I had a different name at the start and then later on I changed it back. You can do many things — like when you were doing your degree. Zhang: Yeah, that was a rough time. Lowe: And still turning up to all those parties and also doing photography, and I was like, Wow, I slept until 12 today. Zhang: I felt invincible, though, because I was a child. I think starting when you’re young is such a great thing — you’re fearless. It’s like skateboarding when you are child and you are going down a hill and you’re like, Wooo, this is really fun, and then you fall on your face and it really hurts, and you cry for a second and then you just get up and keep going. I love the Keanu Reeves line. I love all of your work and from every aspect, photography, writhing, layout… The whole thing girl! What a needful topic you write on. Surely it’s everybody’s concerns and should help each other if anybody found the solution of the problem. Moreover, it is suggested to you that you should also have some research on that yourself. It’s Amazing blog. I really Interested in our blog. we arer also providing ATLAS Equipments is one of INDIA’S leading manufacturer of Road construction machinery and Civil Construction Machinery. We have simple solutions to help our clients and we specialize in delivering professional-grade solutions for customers. Also develop and design batching plant and mixing plants. I think this is a really great blog! Very creative and I love the way they put there clothes together. All the work they put into this blog to make it so amazing! I want to read every article and find all the clothes! I think this is a really great blog! Very creative and I love the way they put there clothes and New Fashion Trend together. Very nice blog. Nice trending updates. Both looking very nice.